1From the Start menu, choose All Programs→Accessories→Remote Desktop Connection. 2If the computer you want to connect to is available from the drop-down list, choose it. Otherwise, type the computer’s name. The computer must already have been configured to accept a remote desktop connection. You must log in to the remote computer by using an account on that computer. 4In the security window, type your User Name and Password. Follow the same process as you would for logging in to the other computer. Wait a few seconds. Eventually, the laptop’s screen changes. 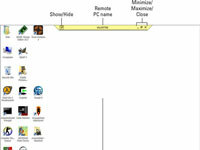 What you see displayed is the other computer’s desktop. 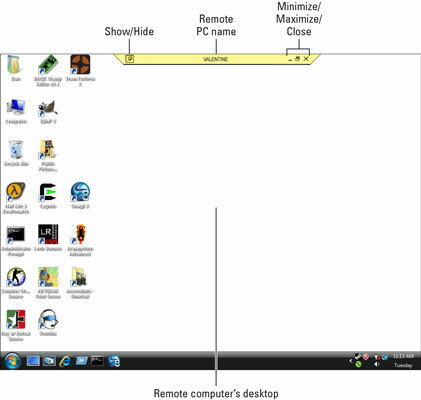 When the remote desktop is set up and connected, what you see on your computer’s screen is the display of another computer on the network. Moving the mouse on your computer moves the mouse on the other computer, and ditto for the keyboard. It’s just as though you’re sitting at that computer, when you’re actually working things from a remote location. 7To break the connection, click the X button in the strip at the top of the screen. 8Click OK to confirm the disconnection. The connection is broken, and you’re using only your own PC again.